Have you ever found yourself stuck for a child's birthday card? I think I may have just the answer you are looking for and it only requires 3 dies! 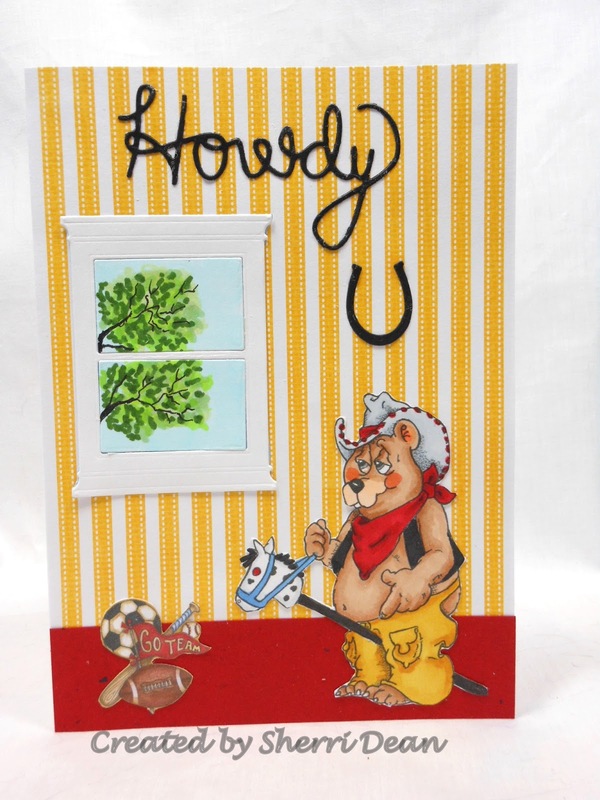 Poppy Stamps Small Madison Window Set which comes with a shuttter, a window box & flowers or you may also use the Poppy Stamps Small Madison Window which is sold alone, Poppy Stamps Lucky Horseshoes & the Frantic Stamper "Howdy" sentiment. I notice some of these are out of stock as I post, but by adding your name to the waiting list, you will be notified by email the second they are back in! I began with a darling digi from QKR Stampede. I thought it would be fun to recreate his "room" complete with horseshoe hanging on his wall. I think this is a card any little cowboy would like! Don't forget to join our current Dies R Us Challenge Blog for a chance to win a gift certificate to the fabulous store! I think once you stop at the store & see all the different stamp companies we carry, it will be come your new favorite place to shop!